DIAL: Blue dial with luminous filled applied indexes. Date aperture at 3 o’clock. CONDITION REPORT: The dial is in mint condition the tritium markers have a perfectly even patina. The bezel is in perfect condition and retains its original tiritum. The case appears to be unpolished and edges are sharp. The overall condition is excellent and all original. 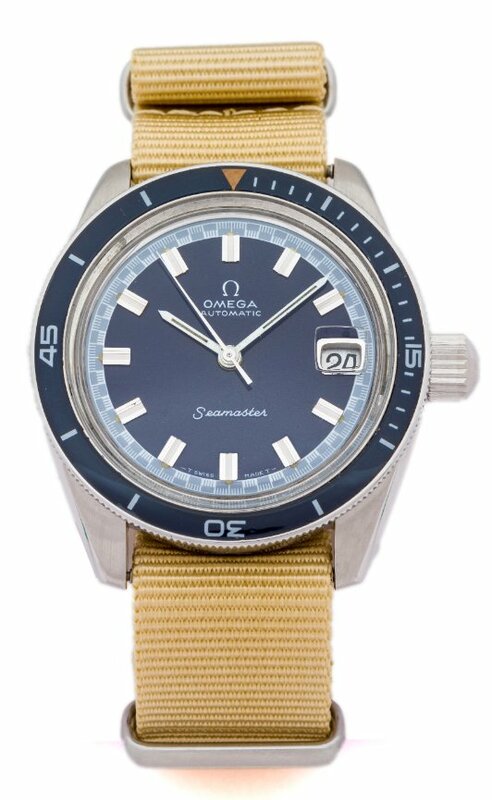 NOTES: This watch was delivered to Italy in 1971 according to the Omega Museum. The Seamaster was launched by Omega in 1948 to coincide with the brand’s 100th anniversary and is the oldest model in the current collection. Loosely based on the waterproof wristwatches made for the British military at the end of World War II, the Seamaster was first intended as a robust yet elegant watch for active individuals who wanted a watch for ‘Town and Country’. The first watches were equipped with self-winding movements in both standard and chronometer versions, the latter being universally appreciated for their robustness, accuracy and reliability.